The day broke with gusty winds of 15 – 20 mph but at least there was no rain. We decided to put up 9 nets instead of the usual 10 nets. We also adjusted a few of the net locations to tuck them into the woods out of the wind. The result was 18 birds with one very special bird. One of the volunteers handed me a bird bag saying, “I’m not sure what it is” which always gets my attention. I reached into the bag and pulled out a medium sized warbler with muted brown coloration on it’s back and wings. It had a long bill and a distinct supercilium stripe. The plumage on the chest and belly is a beautiful light yellow reminiscent of the Eastern Phoebe we caught last spring. 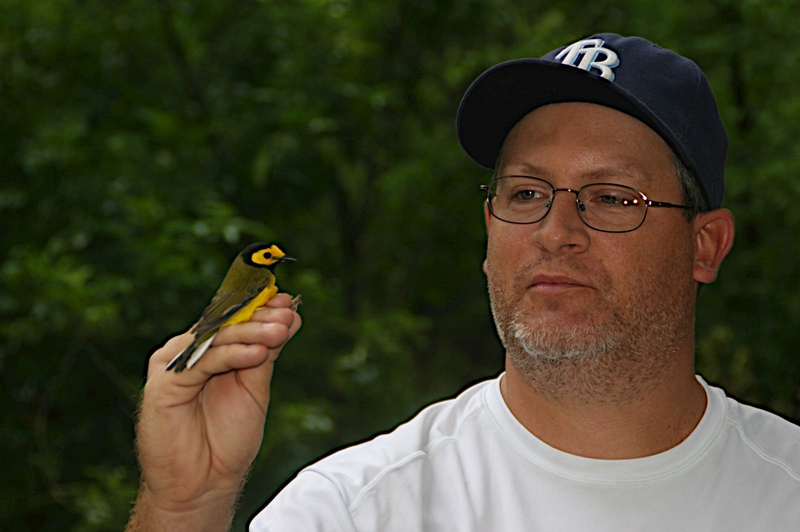 We had 9 White-eye Vireos, a pair of Hooded Warblers and a handful of recapture Northern Cardinals. The other highlight was a nice Wood Thrush. I wonder what we will encounter next Sunday. I hope you all can come to Hammock Park next week to see for yourself. If you can’t make it, stay tuned. 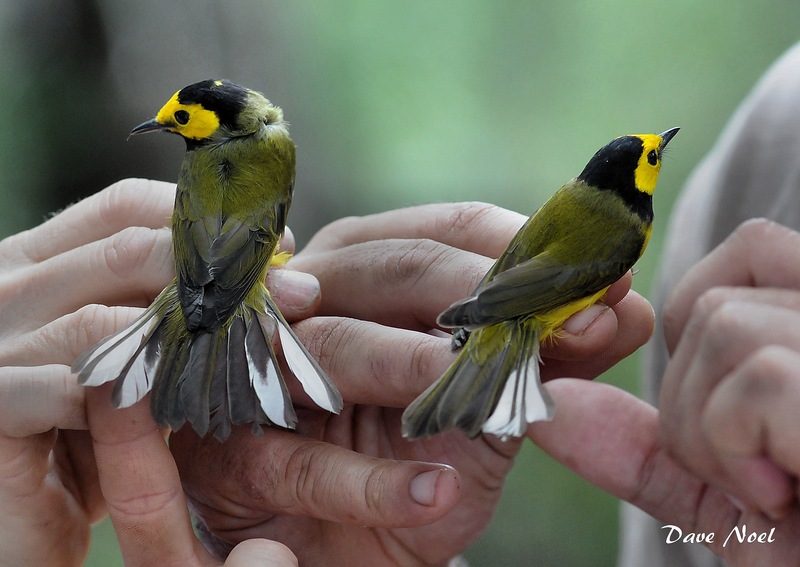 Up close and personal with a male Hooded Warbler. 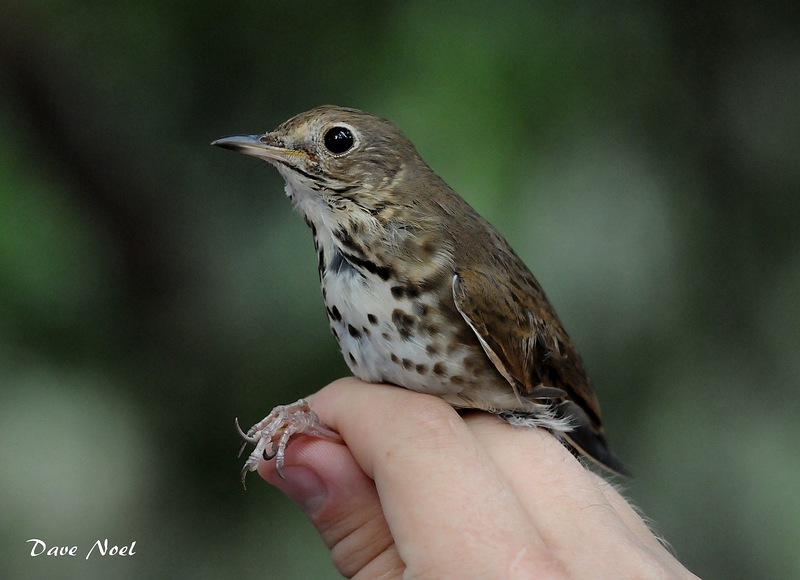 Second Wood Thrush caught in the Hammock. 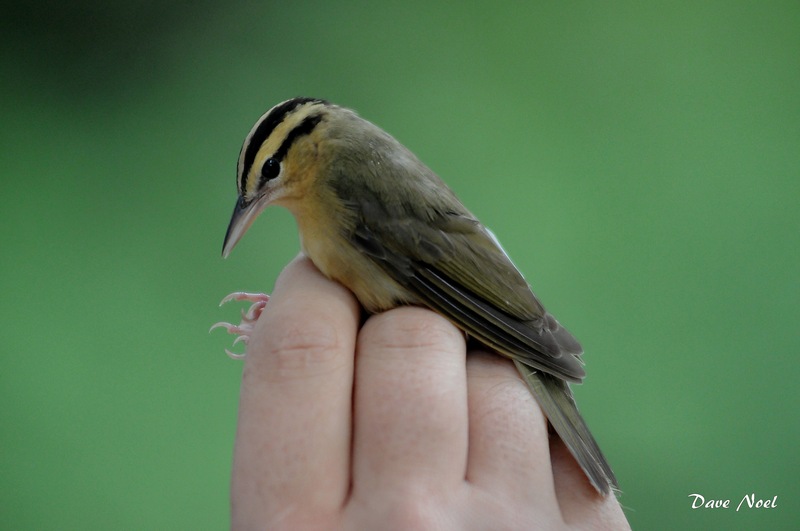 Spring Migration Banding Starts with a Bang! For everyone following our new blog who has been thinking about coming to visit the banding station you missed a great day in the Hammock. We had a total of 41 birds of 12 different species. The big winner for the day was the White-eyed Vireo with 19 individuals with the Gray Catbird (6) and Hood Warbler (5) a distant second and third place. The weather was overcast with a few sprinkles during the morning which may have pushed some birds that typically stay high in the canopy lower and into our nets. 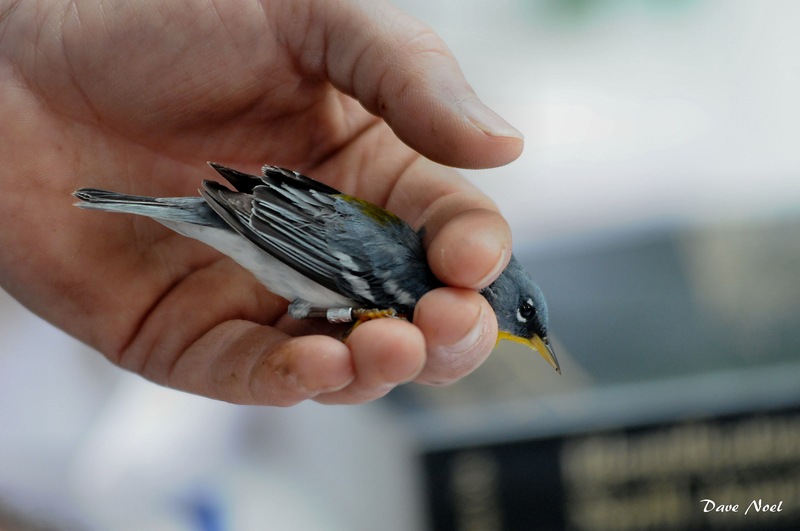 The two species that fall into this category were the Blue-gray Gnatcatcher and the Northern Parula warbler. Both were first time captures for the station. Nice comparison of Male Hoodeds. The females may start showing up next week. Test Your Thrush ID Skills – Who Am I? The other big surprise was the 2 Eastern Screech Owls (grey & red phase) that landed in the nets before the sun came up. Volunteer Andrew gets the “Purple Band” award for the minor injury he got from one of the owl’s talons. Way cool birds! Another highlight were the 7 birds that were recaptures. In addition to the cardinals, downy woodpecker and Carolina Wren residents we had an Ovenbird, a House Wren and a Gray Catbird return. 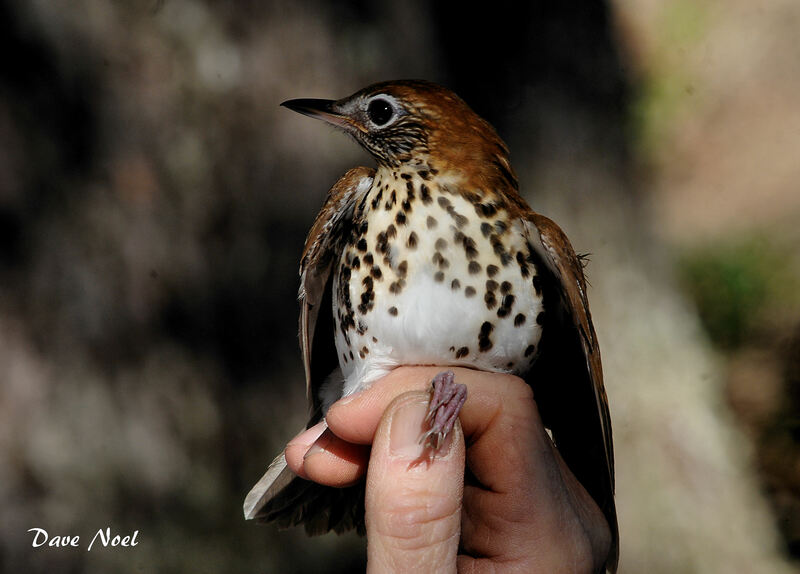 The Ovenbird was banded on 9/23/2012; the House Wren on 10/13/2013 and the Gray Catbird on 4/7/2013. Really cool to start getting recaptures of migratory species.